Ford Motor’s India business has finally posted a profit for the first time in nine years in the fiscal year 2018. The American carmaker’s India business has recorded a profit of ₹ 526 crore in FY18 against the loss of ₹ 521 crore in the previous year, the company has reported to the Ministry of Corporate Affairs. Ford India has taken cost reduction measures and has improved its capacity utilization after it made India an export base. The American carmaker has also collaborated with Mahindra in India to develop new SUVs and work on Electric Vehicle technology. Concerning over the disruptions in the global market, Ford has adopted a new model which it calls the ‘Emerging Market Operating Model’ which has helped the company in cost reduction in India of over 37 per cent in past few years. The company has made its India operations profitable at the time when it is facing a slow demand in China and some challenges in the US which is its home market. The company earlier had announced that it will only sell SUVs in its home market. In FY18, Ford India has recorded a 16 per cent increase in its export volume at 1.8 lakh units along with a spike in domestic sales which together has helped company’s India’s business to grow by 15 per cent at 2.7 lakh units. The American car company had laid out a five-year plan a couple of years back which emphasised on strong branding, right product mix, competitive costs and effective scale to boost the business in emerging markets. 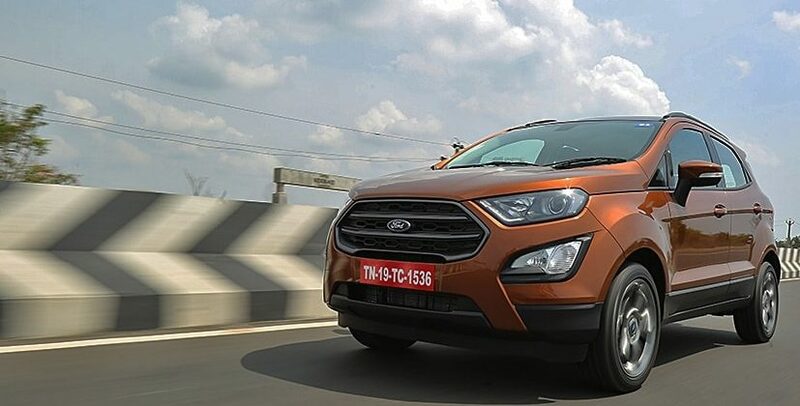 Ford has been on the throttle in India market and has launched three models with a year starting with the Ford Ecosport in November 2017, Ford Freestyle in April 2018 and the Ford Aspire facelift in October 2018. Ford India had previously posted a profit in 2009 when it had rejigged the Ford Ikon line-up with new variants. It was the time when both the Ikon and Fiesta classic were gaining traction in the Indian market and Ford was in preparation to launch its first ever hatchback in India- the first generation Figo.